I hadn’t even planned on online shopping that night — and, while I’d been in the market for a new wallet, I wasn’t considering Kate Spade as an option until I received this email. But those two words — last chance — compelled me to click, and subsequently purchase, from Kate Spade’s website. I mean … I didn’t want to miss out now, did I? Limited time offers are rooted in the psychological phenomenon known as loss aversion, which is the idea that people prefer avoiding losses over acquiring gains. Simply put, someone would feel more upset losing $10 than they would feel happy winning $10. When I received Kate Spade’s limited time offer, I immediately felt an impending sense of loss — if I didn’t act immediately, I’d lose the bargain. This spurred me into action. This is why limited time offers could be a good tactic to drive sales for your business. Here, we’re going to take a look at impressive limited time offer ad examples, as well as compelling limited time offer wording, to ensure you’re able to create your own highly engaging limited time offer ad. 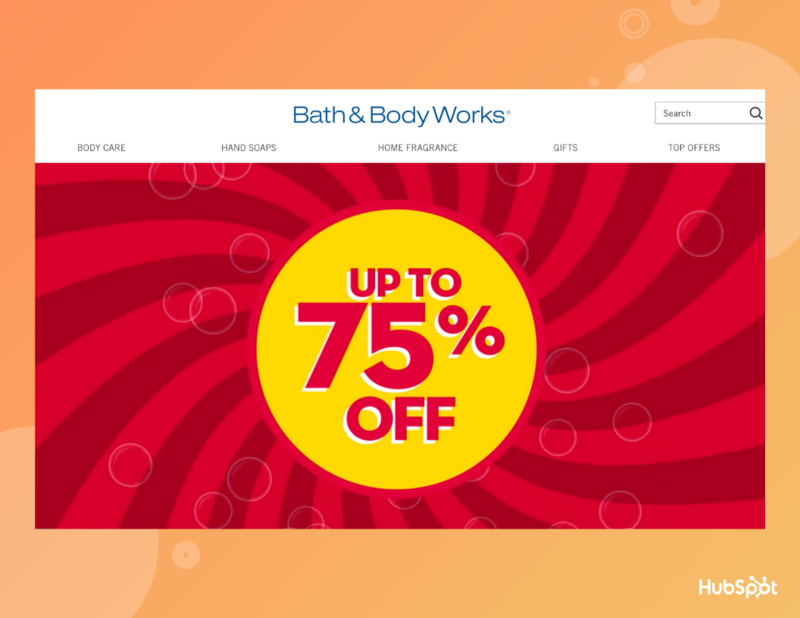 Bath & Body Works Semi-Annual Sale impressively has its own landing page, and uses cute cartoon rubber ducks in a 42-second video to convey their deal. Plus, the limited time offer is incredibly compelling, using phrases like “up to 75% off storewide” and “the biggest sale of the year” to urge hesitant shoppers to stock up on their favorite soaps and candles. When creating your own offer, you might consider going all-out with a landing page and video to signify the importance of the deal. Image courtesy of Bath & Body Works. Every fall, Dunkin’ Donuts’ customers can get excited for new flavors for a limited time, including Dunkin’s Pumpkin Crème Brulee Latte. Their “Pumpkin’s Back, Get Pumped” messaging is funny and clever. This ad likely encourages returning customers to drive to a Dunkin to try something new — additionally, it could appeal to a new demographic particularly intrigued by the pumpkin flavor. For your own limited offer, consider a seasonal product you might offer to incentivize both new and returning customers to purchase. Target often offers limited time two-for-one deals on their products — in fact, they have a “Buy 2 Get 1 Free” landing page for their video games. Additionally, they temporarily offered a $10 gift card to incentivize customers to pre-order Borderlands 3 before April 9. For your own offer, you might try offering added value, like a gift card, on a product to encourage initial interest. Tobi, an e-commerce clothing store, does an impressive job regularly attracting visitors to its site through deals and limited offers. For instance, take a look at this “60% Off Denim Sitewide” email from Tobi. The use of emojis helps the offer stand out in the user’s inbox, and could even help a user more easily spot the email again after she opened it. Similar to Tobi, you might also consider offering an all-encompassing sale on a specific product category, like ‘Denim’. Whether a user is interested in shopping for denim or not, the offer will likely peak users interest enough to attract more traffic to your site. Not going to lie — the ticking clock at the top of their web page even incentivized me to peruse some of Macy’s temporarily on-sale products. Additionally, the “lowest of the season” messaging could urge hesitant shoppers to purchase products today from Macy’s, rather than waiting to compare competitor’s prices. Perhaps you offer your own “Lowest Prices” deal, which could motivate shoppers to purchase your products immediately. Use video, not just text, to convey the deal. Get clever with your wording. Give away a gift card in exchange for a specific purchase. Use emojis in your email blast. Offer sales on certain product categories. Put a ticking clock at the top of your web page, so users feel an added sense of urgency. Next, let’s consider what type of wording you’ll want to use in your limited time offer to truly motivate users to purchase immediately. These are the types of phrases you’ll see accompanying limited time offers, and for good reason — all of these phrases convey a sense of urgency, and even inspire a sense of anxiety in viewers. When you see “Don’t wait!” in your inbox, for instance, you’re more likely to pause and consider your options right away, since the messaging is clear — you don’t have the luxury to consider your options tomorrow. Of course, you want to be cautious with your limited time offer wording. If you’re too aggressive or pushy, you risk frustrating viewers into deleting the message completely. When wording your limited time offer, you’ll want to consider why this deal is special, and how long the deal lasts. Additionally, it’s critical you include an exciting and compelling CTA. Remember how Bath & Body Works mentioned “The biggest sale of the year”? It’s necessary to tell viewers why your deal in particular is special. If it isn’t the biggest sale of the year, maybe it’s the first deal you’ve ever offered on a specific product, or a new seasonal product only offered for a limited time. Ultimately, users need to know why they should care about this deal over all the other deals flooding their inbox. Additionally, it’s vital you clarify the time period of the deal. “Hurry, deal ends tonight!” is helpful, as is, “Offer valid through April 31” or “Today only”. You’ll need to let your viewers know how long they have to act on your offer. Finally, you’ll want to include a compelling CTA. For instance, when I click on Tobi’s “60% Off Denim” link, the CTA says, “Get 60% Off Now”. Who wouldn’t want that? Alternatively, you might try “Sign Up for Savings”, “Claim Your Free Wallet”, or “Send Me The Coupon”. Take a look at “31 Call-to-Action Examples You Can’t Help But Click” for more CTA inspiration.